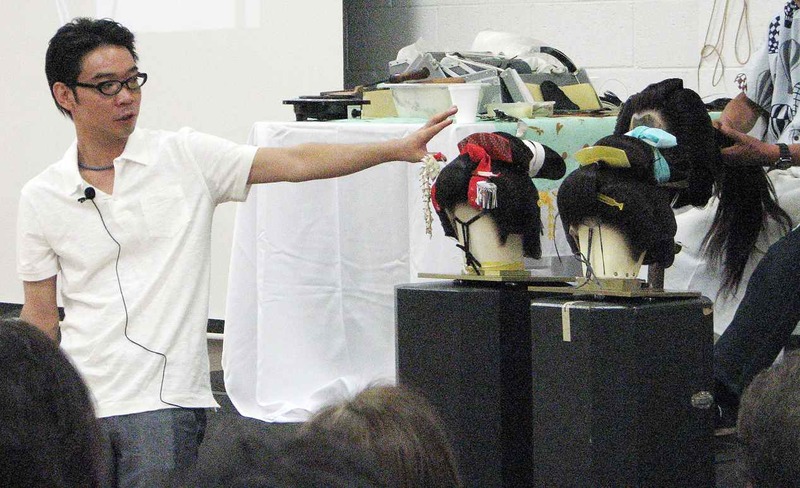 Kazuhiro Toyotani shows examples of wigs that he and his father make for kabuki and classical dance. GARDENA — Japanese wig stylist Tokuo Toyotani gave a demonstration of his craft during a program titled “The Art of Tokoyama” on Aug. 6 at the Gardena Valley Japanese Cultural Institute. Toyotani, of the renowned Gekidanshinpa Theatrical Group, showed how to comb wigs used in kabuki and classical dance, assisted by his son and protégé, Kazuhiro Toyotani. English translation was provided by dance instructor Bando Hidesomi. 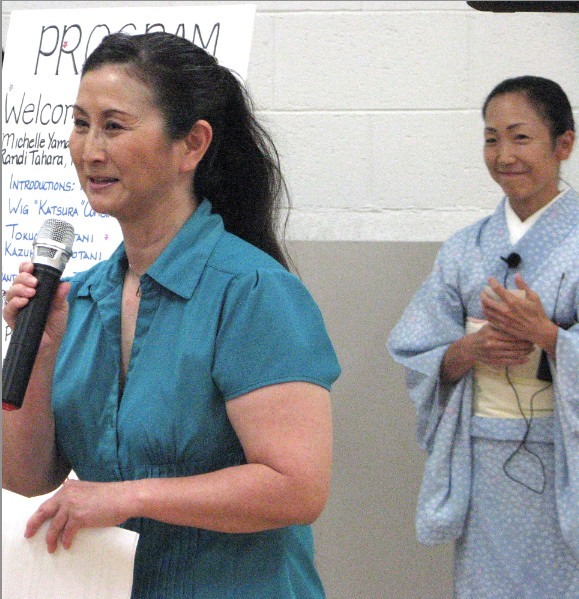 Opening remarks were made by Michelle Yamashiro, GVJCI manager, and Randi Tahara, president of Nihon Buyo Kai of California, a nonprofit organization that supports Japanese traditional and classical dancing. “We are composed of students from the Bando Ryu of classical dancing, so our board members are made up of Bando natori and longtime supporters,” said Tahara, who also informed the audience that noted instructor Bando Mitsuhiro had passed away earlier that week. The younger Toyotani explained that a wig or katsura goes through a two-step process. First a katsuraya makes an aluminum or copper framework (daigane) that is fitted to the dancer’s head and sews the hair (usually human hair) onto the habutae, which is made of silk and fitted over the metal foundation. Then the tokoyama’s job is to comb and stylize the wig according to the type of role that will be performed. 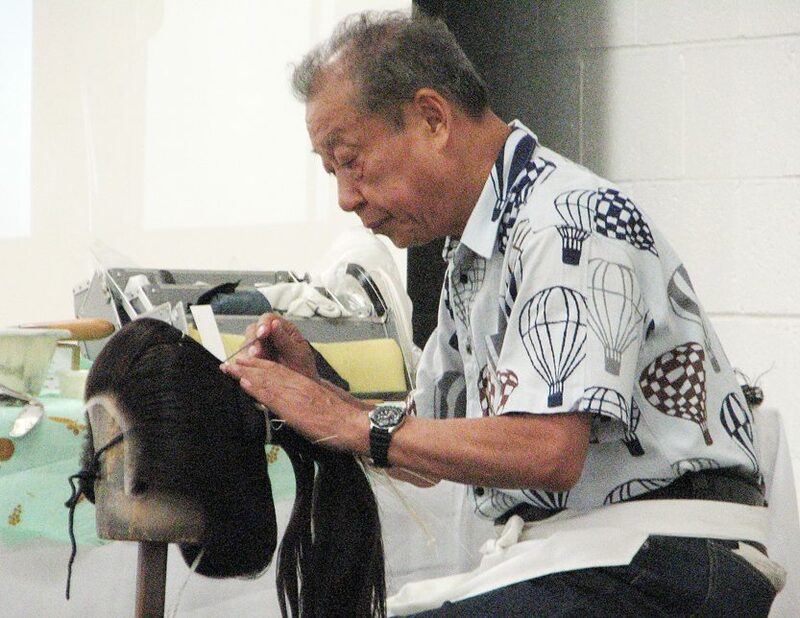 Tokuo Toyotani demonstrates his skills as a tokoyama, who combs and stylizes wigs. The traditional hairstyles became less popular from the Meiji period on, but can still be seen in maiko, sumo wrestlers, and other practitioners of traditional arts. Tokoyama for performing arts and for sumo are considered separate crafts and are not interchangeable. The elder Toyotani used special oil and wax to shape the wig, which consisted of bin (sections of hair on both sides of the face), tabo (hair on the back of the head), mage (central section) and maegami (forelock). Tokuo and Kazuhiro Toyotani fit Bando Hiroharumi with the just-completed wig. Wigs of various styles were displayed. The style used for the demonstration was taka-shimada, in which the mage is elevated above the crown of the head, which is common in geisha dances or geisha roles. The demonstration was followed by a Q&A session with the audience. The Toyotanis then fitted the katsura onto the head of Bando Hiroharumi, who performed “Chiyo no Matsu” (Eternal Pines). Randi Tahara of Nihon Buyo Kai and Bando HIdesomi, who served as translator.